This 2 point Automatically Locked safety belt with 11500mm length and 47mm width, thickness is 1.2mm,the short side length is 230mm. This belt has passed the national compulsory 3C certification, a tensile strength of more than one ton, 10N ≤ lock opening force ≤ 60N, ultra-durable normal open more than 50,000 times. 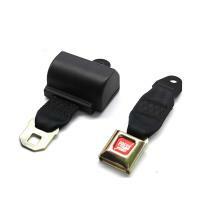 As an added benefit, this extender will allow you to access your seat belt buckle more easily.